Brief Description Take a RIDE ON THE WILD SIDE aboard an adventurous airboat! 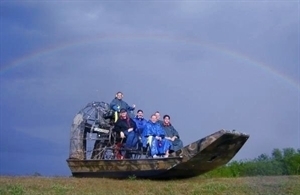 Description We invite you to come to the bayou & experience the ride of you life on an airboat. You can take a lazy leisurely ride or a more adventurous RIDE ON THE WILD SIDE! Also available are kayak, canoe & pirogue rentals. Add Airboat Tours By Arthur Matherne to your free online travel itinerary.